Godsgrave (2017. 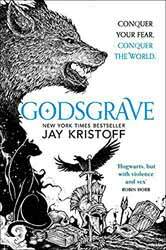 419 pages) is the second book in The Nevernight Chronicle trilogy, written by Jay Kristoff. Originally published as a hardback, the novel now sees the light of day as a paperback edition. Both in content and structure the second novel is very similar to the first book, Nevernight. The world of the novel is not the usual faux medieval Earth which is normally the backdrop for fantasy books, for a start it has three suns. This trio is not just placed in the book to provide flavour; it has a direct impact on how the heroine, Mia, is able to function. Mia has changed considerably since the first novel and while that concentrated on her travails in becoming a Blade assassin, this book opens up with her fully engaged in her new employment.